Hibiscus tea has many names in different countries and cultures, and people around the world enjoy the bright color and sweet flavor either hot or iced. Origin: A tropical plant known for its bright red flowers, hibiscus has been used to make traditional beverages across the world. Egypt, the Caribbean, Italy, Cambodia, and other cultures have enjoyed various forms of hibiscus tea. Aroma, Appearance, and Taste: The red, tart, and fruity liquor may call to mind unsweetened cranberry or pomegranate juices. 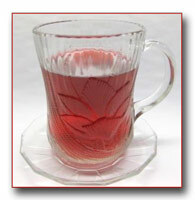 Hibiscus teas are often sweetened and combined with citrus flavors (like lime, orange peel, or lemongrass). Considering its warm climate origins, it can be a great summer treat, and it also finds its way into tropical-style cocktails. Benefits: Hibiscus tea is naturally caffeine-free and contains higher levels of vitamin C than many other teas. In at least one study, healthy adults with moderately high blood pressure saw their systolic pressure readings drop an average of 7 points after drinking 3 cups of hibiscus per day for 6 weeks. Steeping Tips: Most hibiscus teas and blends with hibiscus can be steeped in boiling water for 5 – 8 minutes. Garnish with citrus (lime or orange) peel, or a mint family member (spearmint, peppermint, or lemonbalm). Sweeten to taste. 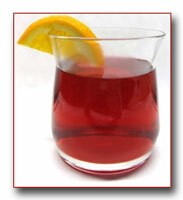 Trivia: In Jamaica, hibiscus (called sorrel) tea is a traditional Christmas drink. In the United States, the plant increased in popularity when Celestial Seasonings introduced its Red Zinger® tea in 1972. Where To Get It: Hibiscus Caffeine-Free Herbal Blend – Rishi Tea, Traditional Medicinals, Hibiscus Punch – Teas Etc. Hibiscus tea is widely sold in loose leaf varieties in tea shops across the world. Jason Walker publishes Walker Tea Review (walkerteareview.com). He has lived in China and traveled to tea origins in China and Taiwan. Jason writes for tea publications, books, and tea businesses.